According to a recent survey, women spend over 1,000 days in the kitchen in an average lifetime. But many women reading this may not be surprised, as the amount of time women spend in the kitchen is persistently underestimated and undervalued. The survey, which polled 1,000 British mothers, found that the average homemaker will prepare breakfast, lunch and dinner for over eight hours a week for their family. This equates to nearly 18 whole days a year, and across the average woman’s adult lifetime of 63 years the figure comes in at 1,117 days. In addition to making sure the family are fed and watered, women choose to spend some 20 minutes a day in the kitchen relaxing away from the family, for example watching television or reading the paper. All the more reason, then, for any planned home improvement to live up to what has come to be called “the kitchen dream.” OK, so you’ve got to be in there. So why should it not be as labour-free and indeed pleasurable as possible? For many years, the clean-cut streamlined German kitchen has been the benchmark of kitchen design and with reason. 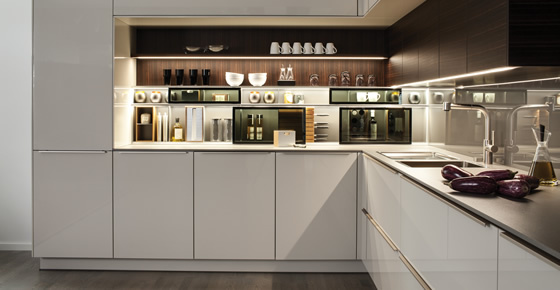 The Germans have become experts at making cleverly-designed kitchen units in a well-calculated choice of sizes that, when carefully planned and correctly installed by a well-established kitchen specialist, will neatly provide the fitted kitchen to which we all aspire. Colours and finishes have kept pace with changing fashions, and the big brands have a reputation for innovation and quality worldwide. Continental kitchens have suited well the pared-down miminalist aesthetic, which has been prevalent in domestic design since the mid 90s.They fit seamlessly into the open-plan living which has become de rigueur for home conversions. They can be as quiet and unobtrusive as you wish, or a flashy focal point with glossy coloured door finishes and/or exotic veneers. The best known brands are good value and well-priced – the Germans sell so many kitchens they can operate economies of scale. And consumers benefit from the large amount of money put into research and development, producing, for example, ever-cleverer storage solutions, and more robust hinges, handles and drawer runners – the Germans being famous, of course, for their engineering. Most of the biggest names in German kitchens have been established since far back into the last century, and they tend still to be family firms. Specialist dealers (and you should always buy from a kitchen specialist) have long experience of working with German companies. They know the brands they stock and their products inside out, and can offer a well-tuned professional service for planning and installation. Top of the range appliances tend also to be made in Germany, so there is a natural synergy between brands. Italian kitchens, too, have a following, offering originality and design flair at the upper end of the market. Nevertheless, British kitchens are on the up and up, so I am talking this autumn about buying British, a theme that’s been much in the news lately. British kitchens are predominantly made from wood, and/or wood composites, and there is a swing- back in design to this kind of “natural” material, particularly when the grain is allowed to show through. Timbers such as oak, ash and beech are perceived as being intrinsically British. Buying a British kitchen chimes in with the growing desire of environ-mentalists to buy locally-made goods, where possible also made from local materials, to avoid the costs of transport and delivery. Aesthetically, most companies making kitchens in Britain have at least one range with traditional panelled doors, cornices, dresser-type units and more. This harks back to a time when kitchens really were the heart of the home, and this slogan was not just a marketing ploy. Moreover, it’s often possible to “refresh”/update a British-kitchen at a later date without too much difficulty. The original suppliers are likely to still be trading, and based within reasonable distance. A wooden door can be refinished. Painted finishes, enjoying a new wave of popularity, can be reapplied and colours changed to mirror changing fashions. All this strengthens the environmental appeal. There is also the emotional, social and even political appeal of “buying British.” Let Graham Jones a director at Mereway Kitchens explain. But first a word about Mereway (www.merewaykitchens.co.uk). They are leading manufacturers of high quality kitchen furniture, with an extensive network of independent retail outlets nationwide. Over 26 years, they’ve built up a sound reputation for attractive British hand-crafted kitchens, backed by solid customer service. Kitchens are made from traditional materials using traditional methods with careful attention to detail. They have an award-winning environmental policy, which includes the accredited sourcing of their timber, the minimised energy used in their factory, and the stringent reduction of transport/delivery costs. Recently Mereway Kitchens introduced its Modern Classic range, as part of their English Revival collection, describing this as a “new look for traditional Shaker designs”. 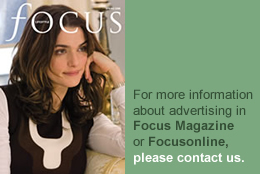 Graham Jones (as profiled in a recent issue of The Designer, a specialist magazine for the kitchen and bathroom industry) is a passionate advocate for buying British. He believes that the Made in Britain label is enjoying an upsurge in popularity and consumer confidence – “the Olympics, the Jubilee, and the royal baby and subsequent royal tour have certainly been a contributing factor.” But there is hard research, he says, that customers respect the Made in Britain label and are willing to pay more for it. A recent survey by the campaigning organisation Make it British (www.makeitbritish.co.uk) found that 43% of people would definitely pay more for a product made in Britain. Even more –- 60% – agreed with the statement “If I know that a product is made in Britain, I would believe it to be of good quality.” Mereway have the Made in Britain mark on all their marketing material. Jamie Telford, director at Roundhouse kitchens (www.roundhousedesign.com) is another flag-waver for the growing made-in-Britain sector of the kitchen industry. Roundhouse are independent British kitchen designers and manufactures, with seven showrooms nationwide, who describe their approach as embracing “the house, the home and the whole creative process – from concept to completion.” They design bespoke kitchens, wardrobes and other furniture, handmade to order in their own British factory. The flagship store is in Wigmore Street, London W1 and the Surrey showroom is in Guildford, where designer Paul Welburn has a reputation for very personal service. Roundhouse are winners of the Homes & Gardens ‘Kitchen Designer’ 2013 Award and The Designer magazine’s ‘British Design’ Award 2012. 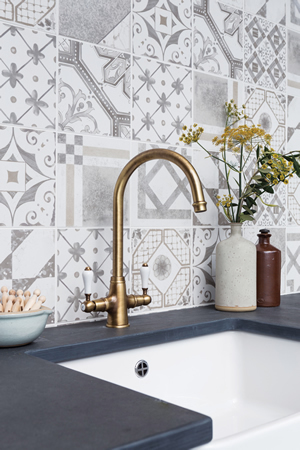 There are many other British kitchen brands that have led the way in putting British-made kitchens at the very top of the trade. 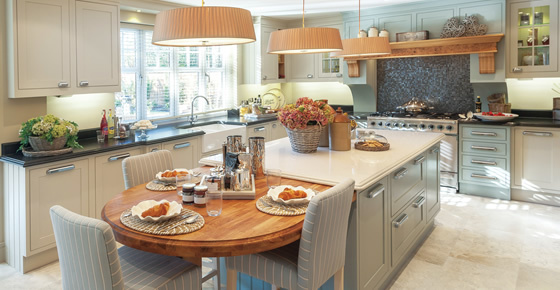 Smallbone (smallbone.co.uk) for example, has been designing and making fine furniture in its Wiltshire workshops for over 35 years. Over the past twenty years, Plain English has earned a reputation for simple, elegant kitchens that stand the test of time, thanks to classic design and the quality craftsmanship. Joiners in the company’s Suffolk workshop make the cupboards from environmentally sustainable materials. (www.plainenglishdesign.co.uk). Whatever style of kitchen you finally choose, and wherever it is made, do not forget the caveats we always include with our kitchen articles. Write down a list of all the things you hate about your current kitchen. This will help you decide what you would like to have by contrast. Assemble a folder of tear-sheets from magazines, catalogues, print-outs, samples and so on for inspiration. 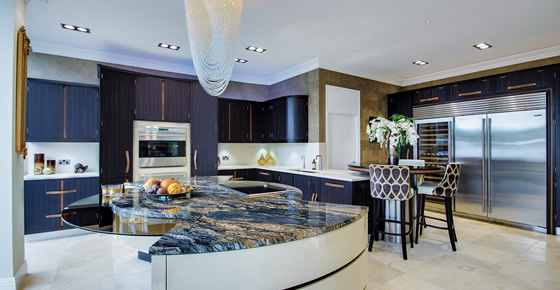 Buy from an established kitchen specialist, preferably one who has been personally referred to you, (visit at least three specialists before making a choice). Ask for references to previous clients, and, if spending a substantial amount of money, ask if it is possible to see past work. Ask also about guarantees and how your deposit will be protected. Check carefully who will do what work – firms vary widely on how much they will undertake, and for what they accept responsibility.